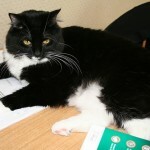 Perl is a black and white tuxedo female cat with medium hair born 5/5/06. She is Py’s littermate, although they look nothing alike. She has very long, elegant whiskers and a cute little white “kiss” on her mouth. One of my favorite things about her is that some of her foot pads are black and her toe pads are pink. Perl enjoys lounging around the back of the couch or on the cat perch on the porch during the day, or sitting on my computer mouse while I’m trying to type. She kneads my tummy every evening before bed. Perl also loves to play soccer with a small ball made out of tinfoil, and out of my three cats I think she enjoys catnip the most. 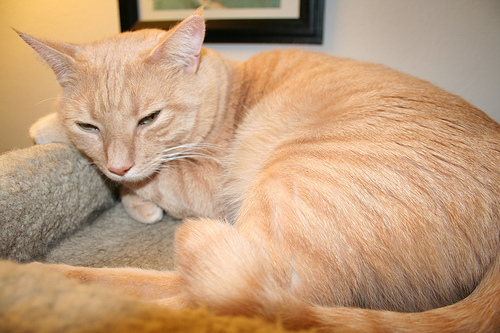 Py is a short haired butterscotch tabby born 5/5/06 and is Perl’s littermate. Py and Perl were raised as kittens by a foster family and they are both very social. Py likes to be in the same room as us all the time and he likes to watch over things. When motivated, Py is by far the fastest and most accurate cat, although he’s not always interested in chasing toys. Py spends every night curled up on the pillow above my head. Tyrone was probably born around May or June of 2007 on the streets of Baltimore City. 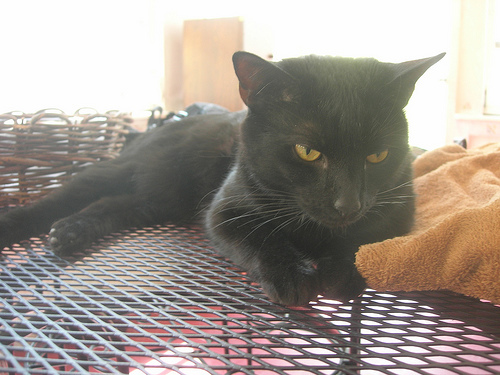 He is all black, except for a tiny white patch of a few hairs on his chest. I found him as a stray, and although he can be very cute and cuddly and loves to play (he can jump really high!) he is also the most stand-offish of the group. He hates having his nails trimmed, and he’ll hiss and run at the dog whenever she tries to get him to play. He usually does his own thing, but often enough we can find him curled up in front of the fireplace, happy to have a place to call his own. Cocoa is a black lab/pit mix and perhaps other breeds are mixed in as well. 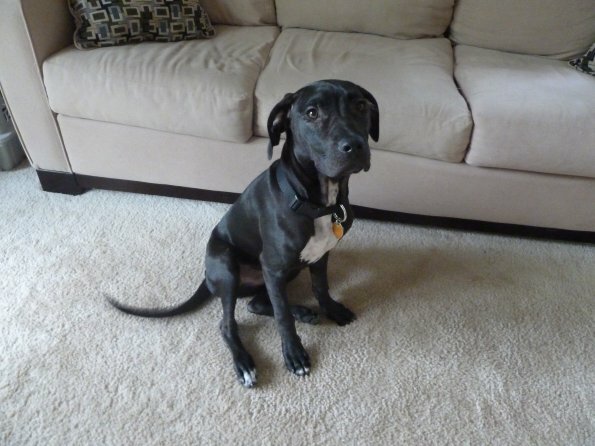 She is more slim than most labs, weighing just under 60 lbs, and she has great ears that stick out to the sides. We adopted Cocoa from BARCS, where they posted her birthday as Feb. 23, 2008. Cocoa has plenty of energy and enthusiasm, willingness to learn, and eagerness to play, but she’s also a little princess who enjoys snoozing on the couch or bed during most of the day. She absolutely loves playing with other dogs, so the dog park is one of her favorite spots. Cocoa loves to play fetch and jog with me every morning, and she recently learned how to swim at the dog beach at Quiet Waters Park in Annapolis and now swimming is one of her favorite sports. 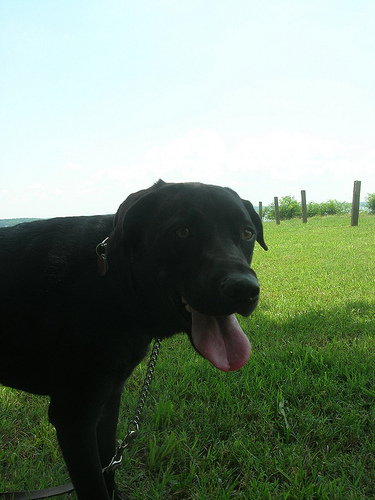 Fred is a pitbull/lab mix with a big personality. He loves to jump around and bark at things for no apparent reason except that he’s just having fun. He is also a *big* snuggle bug and loves to cuddle. He plays hard but crashes hard too and sleeps like a log. He was adopted through Bully Paws rescue in May 2010 at 3 and a half months. Before coming into the care of Bully Paws he was found on the side of the road in a box with his brother, Barney, and taken to a local animal shelter near Richmond, VA. Bully Paws pulled both Fred and Barney out of the shelter and put them in a foster home with 16 other young puppies until they could put on some weight and be adopted out. When he came to us, Fred had a bad case of Lyme Disease so he was really sleepy all the time, but once that was cleared up with some antibiotics he showed us his true personality! He has been a joy to have in our home and Cocoa absolutely adores him. He is a great little guy!